KEY WEST, Fla. (AP) — In the middle of Key West Harbor, there’s a modern-day “Gilligan’s Island,” just a short dinghy ride from Schooner’s Wharf. It’s 21 acres of wild green space with a rusting barbecue grill and an empty beer keg swinging from a tree. There was Key West luxury developer Pritam Singh, who lived on the rent-free paradise as a hippie. There were the pot-smokers, partiers, poets and picnickers — as well as artists, vagrants and nature-seekers — who used it to get away from civilization for hours, days or even weeks at a time. Among them were Naja and Arnaud Girard, who own a Key West marine assistance and boat salvage company. The couple have fond memories of their two children playing on the island with kids from other liveaboard families, who grew up on boats anchored off its shore. The Girards started poking around Washington, D.C. archives and online databases, trying to find a way to keep at least some of the island undeveloped. They hit the jackpot: documents that suggested the Bernsteins could not own the island because the Navy had not given up title to Wisteria until 1982. And, when it did, it transferred it to the U.S. Department of the Interior, not the state of Florida. The ownership controversy prompted the Monroe County property appraiser to slash the island’s valuation to $17,900 (it once was $700,000), and it has brought to a halt the Bernsteins’ effort to turn Wisteria into a resort that mirrors its twin island, Sunset Key. But according to Naja Girard, the “real land grab” occurred in 1951, when the state auctioned off the island. She dug up documents that showed the Navy claimed ownership at the time and objected to the auction. The state went ahead anyway. The winning bid was $2,769 by Paul Sawyer, acting as an agent for longtime State Rep. Bernie C. Papy Sr., known as the “King of the Keys.” He took over the warranty deed for $6,100 in early 1952. “We had big, big plans,” said Wolkowsky, now 93. They hired the New York firm that designed the Lincoln Center. It came up with a luxury complex that was eye-popping at the time: 60 homes, a yacht club and a golf course. Not so, said Roger Bernstein. Over the years, the family entertained ideas for a campground and other projects, but none seemed right. Miriam Bernstein died in 2004, and three years later, Roger Bernstein presented a development plan to Monroe County for 35 vacation homes, 35 rental cottages with 85 bedrooms, five workforce houses, a bar, restaurant, retail store and boat moorings. “It’s not a pristine tropical island: There’s garbage trees on there and garbage bushes,” Roger Bernstein said. (The invasive Australian pines that dominate the landscape, along with Brazilian peppers, led to its nickname, Christmas Tree Island.) Bernstein argued that the island had become an illegal dump and a haven for criminals. Last year, he hired 17 workers to haul away the tons of garbage and debris. The cleanup took three weeks and required more than 100 boat trips. Roger Bernstein said the feds have no current need for the island, while he wants to build something the community can be proud of — just as the family did on nearby blue-collar Stock Island: affordable housing, a working waterfront for fishermen and Bernstein Park, which the county had eyed for a jail. Bernstein said he has tried to work with the community, proposing a facility to service the nearby liveaboard boaters. It would offer a store, a dog park, dinghy docks, laundry facilities, a pumpout station and ferry service, he said, for just $300 per month. Last month, the U.S. Attorney’s Office in Miami filed a motion to dismiss F.E.B. Corp.’s lawsuit, arguing that the statutory window for such a claim closed more than 50 years ago. F.E.B. Corp. responded that the United States had never acquired title to the island. 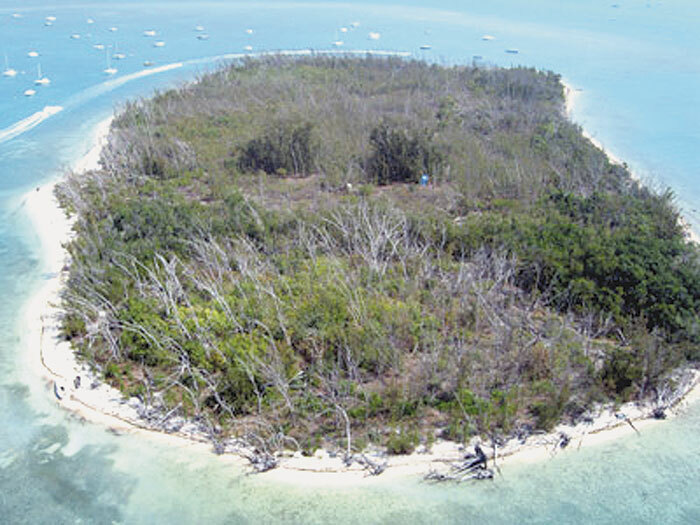 “So, if the federal government grabs it and no federal agency wants to use it, the island will go to public auction,” Bernstein said.